A parliamentary report of 1776-7 listed workhouses in operation at Aldermaston (for up to 35 inmates) and Tilehurst (100 inmates). Berkshire: Aldermaston, Ashampstead, Bassildon, Beenham, Bradfield, Bucklebury, Burghfield, Englefield, Frilsham, Graiseley (Tything) [Grazeley], Padworth, Pangbourne, Purley, Stanford Dingley, Stratfield Mortimer, Streatley, Sulham, Sulhamstead Abbots, Sulhampstead Bannister Lower End, Sulhampstead Bannister Upper End, Tidmarsh, Tilehurst (2), Ufton, Wokefield, Yattendon. Later Additions: Beech Hill, Theale (from 1894). 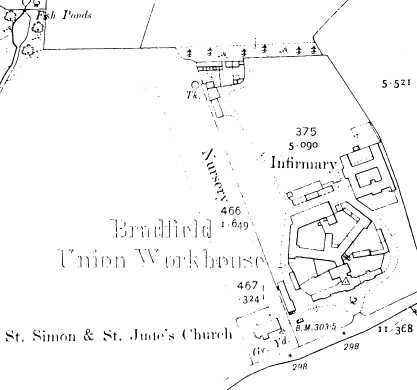 The new workhouse was erected in 1835 on a site to the south-east of Bradfield on north side of the present Union Road. The architect was Sampson Kempthorne and was a Y-shaped design based on his model plans published in the First Annual Report of the Poor Law Commissioners of the same year. Similar designs were also built at Abingdon and Banbury. 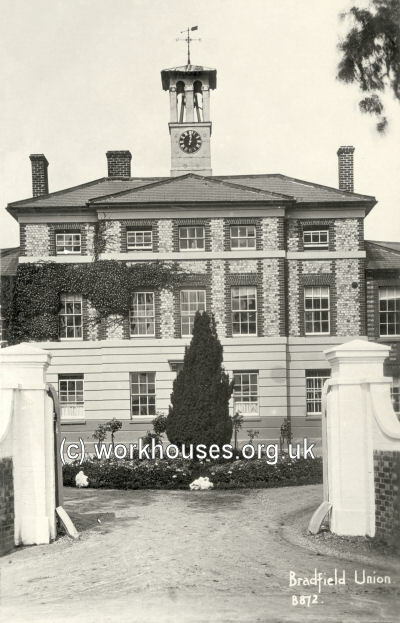 The Bradfield workhouse was designed to accommodate 250 people and cost £7,450. The OS map of 1912 shows the layout of the workhouse with the infirmary added later in the nineteenth century at the north-east of the site. To the south-west, the adjacent church church of St Simon and St Jude with its graveyard can also be seen. Similar Kempthorne designs were also built at Abingdon and Banbury. Bradfield entrance block, early 20th century. The workhouse later became Wayland Hospital and the majority of the structure survived until the mid-1990s. In 1996, all the buildings were demolished except for the front entrance block to make way for the Wayland housing development. 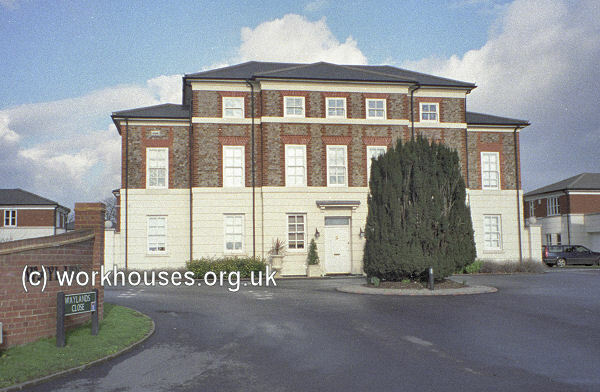 Berkshire Record Office, Berkshire Record Office, 9 Coley Avenue, Reading, Berks RG1 6AF. Holdings include: Guardians' minute books (1835-1929, with gaps); Admissions and discharges (1835-1862); Relief lists (1845-1921); Births (1836-62); Deaths (1835-42); Creed registers (1872-1905); Information against paupers (1835-46); Relief orders (1848-1930) etc.